Since 2001 – 243 deaths occurred in dwelling houses in Wales. In 2013-14 almost 90% of UK fire related deaths occurred in dwelling houses. 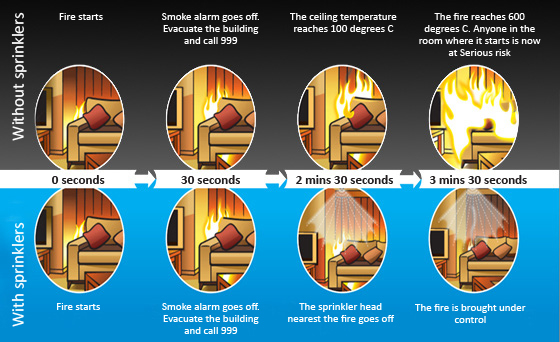 Firefighters now use 20 times more water than a sprinkler with the cost of property damage reduced by up to 90%. Risk of false alarms significantly reduced. Simply reduces risk to life!! The new regulations apply when a new building work creates a new residence or residences, or when a change of use occurs to convert an existing building into a new residence or residences.